Don't stress about how you look on your wedding day. The photos of your wedding will help you remember your day forever – I want to make sure you look stunning in every single picture. I also firmly believe that your wedding day is the one day you should get to be pampered, doted on, and treated like the most important person in the world! I help brides feel and look like the most beautiful version of themselves they’ve ever seen with on-site luxury hair and makeup services in Chicago. Focusing on clean, natural beauty, my expertise lies in enhancing your best features so you feel polished for your wedding day. I pride myself on the relationships that I develop with my clients. I am there to give you honest feedback if you need it, and am there to reassure you that the earrings you bought do, in fact, look okay with your dress. I'm also there to help calm Mom down from her pre-wedding jitters and help her to feel beautiful. Obviously, I'm also going to make sure you look flawless and your hair and makeup will last all night. I specialize in South Asian and Indian weddings. There are so many unique traditions within our culture, and it has been a really special experience for me to be able to work on Indian weddings. My dad was born in India, so it's a cool connection to my own culture, and I have the understanding of the different ceremonies, jewelry, and dressing to ensure everything runs smoothly and everyone is happy. Destination wedding? No problem. Not in love with any of the artists that you’re finding in the area you’re getting marred? Not sure that any of them understand you or your culture? I travel worldwide with clients to ensure that their wedding beauty is flawless on their wedding day. As a lifelong lover of the beauty industry, I truly appreciate the opportunity to help brides be their most gorgeous self on the best day of the lives. I’d love to connect to talk about your vision for your wedding. Please contact me and tell me all about your upcoming special day! I look forward to getting to know you and helping to truly bring out your beauty for your wedding. On-location makeup artists will also come to your location and apply makeup to you and your party. I specialize in soft and natural makeup, but can execute a range of styles. On-location stylists will come to your location and style you and your party's hair. From updos, to beachy waves, to a voluminous blowout, we can achieve the style you are dreaming of. I will be with you until you step out the door to head to your wedding. Literally from head to toe I can help you get dressed, put on your jewelry, put on your dress, wrap your sari, or any other needs you might have. Be your most beautiful self on your wedding day. "Meghana made me and all the ladies in my life feel (and look) like royalty for my wedding in August 2017. She thrives in the pre-wedding adrenaline and was delightful company leading up to our ceremony. What's more, Meghana is very professional and offers excellent customer service. I look forward to the next moment I can hire and/or recommend her services. "Meghana was amazing through the whole process of our wedding! I was on a budget but wanted to gift my bridesmaids their makeup application and Meghana was very understanding. Everyone commented on how amazing my makeup was on the big day, and the maids LOVED theirs as well! I give Meghana 5 stars!!" "Meghana is the best makeup artist I have ever worked with. Her process for arranging day of details was super professional and made it so simple, I did not have to worry about a thing. She traveled from Chicago to Milwaukee to see us, and for a very reasonable price. Her work matches that of those that are double in price. Everyone was so happy with their look, and it lasted all night. Cannot recommend her enough!" "I found Meghana Prasad for hair and make up through searching online. I was looking for someone with experience in Indian weddings since the hair had to support my duppata, etc. In addition to liking her previous bridal looks, I appreciated her organization and responsiveness--she was super easy to work with! "Meghana was absolutely amazing to work with for our wedding. She was able to make all 7 of us look wonderful. No matter our skin type, coloring, and face shape, she highlighted our best assets. Highly recommended for ANY occasion!" I worked with Meghana for both wedding skin prep (facials, dermaplaning, peels) and makeup & hair for both my rehearsal dinner and wedding day. It was a pleasure all the way through! Meghana didn't try to upsell me and was honest about what would work best with my skin, hair, and features. She was always on time (early!) and such a professional. My family who had their hair & makeup done on wedding day all raved about her easygoing personality, talent, and loved how they looked. Even dealing with several non-English speakers, Meghana was wonderful. I would recommend her again and again! "Meghana did my and my moms hair and makeup for my brothers wedding. she was very patient and listened to what we wanted and liked. We had couple early days and she was always their on time to get us ready. She is very professional to work with. I highly recommend Meghana and hope to work with her again!" "Meghana is an amazing make-up artist. Right from my first contact with her to my trial and to my wedding day, Meghana has been so easy to work with and does a fantastic job. I had the most wonderful experience as a bride. I have never felt more beautiful than I did on my wedding day, and my bridesmaids and moms were all so happy with their makeup! We all looked flawless in photos, which really is the best part. I loved Meghana for her bubbly, friendly personality - she was so much fun to have in the bridal suite! She was so flexible when it came to scheduling trails and always responds so quickly to every email. She was also so flexible on the wedding day when we added an extra girl for makeup, Meghana did not complain and was happy to do one more! Thank you Meghana for making us all GORGEOUS!" "Meghana was perfect as my wedding day make-up artist. She is super down-to-earth but at the same time amazingly talented. Most make-up artists paint me up like a clown, but Meghana was a great listener and good at creating the enhanced natural look that desired. I'm glad I had a trial because we did tweak a few thinks to make sure I looked perfect for the big day, which I did! I will post pictures once I get them back. She fit right in during my getting ready party in the hotel and was a fun addition to the party! My bridesmaids and moms also had her make-up services and everyone looked beautiful. I definitely recommend the airbrush! The whole deal was a little expensive for what I'm used to, but I'm paying even more for pictures, so I'm glad I splurged to look my best. She really brought out my inner beauty :)"
"Meghana and her team was a pleasure to work with. She showed up right on time the day of the wedding and worked efficiently to get my bridesmaids and family members ready on time. We were so impressed with her work and how she managed her time. A week prior to wedding, I had a make-up and hair trial done with Meghana. She spent two hours with me to come up with an ideal and desired look for my wedding. She was patient, and listened and incorporated my style to the look I wanted. Having a trial made it easier on the day of, since we both knew what look we were trying to achieve. I would recommend her for bride of any age!" 5 stars, Woohoo! As good as it gets... Yes she is!" "Meghana was wonderful! She is very easy to talk to and an amazing makeup artist. My bridesmaids, mother and I looked like movie stars. I highly recommend her!" "One of the main reasons I went with Meghana was that she responded quickly. I'd contacted another vendor and she, to this day, has NEVER responded. She listened to me as to how I wanted my look for my day and then did it! What a concept! She came to Wisconsin from Illinois and was with the 3 of us for 4 hours. She had to wait until the hair stylist was done so she had down time. It was like sitting around with a very good friend. She then efficiently and beautifully completed 3 beautiful faces for game day! I would hire her again in a moment if I needed a professional makeup job." "I first found Meghana on Facebook, I actually won a contest for a free makeover and she did an expert make up look for a black tie event. After that, I knew I wanted her to do my wedding. We did the trial the same week and Meghana arrived early and set up and was able to exactly know what my maid of honor and I wanted. On my Wedding day, she arrived early yet again and she was able to make my mom and bridal. Party look exactly how they wanted and she was so friendly with everyone. I received so many compliments and I would not hesitate to recommend her to anyone. Thank you for making my wedding look perfect :)"
"I worked with Meghana during my recent wedding festivities and had a wonderful experience. Throughout every exchange we had from the first email communication, through my trial appointment and on my wedding day, she was friendly and professional. She was also patient and an excellent listener who provided creative, personalized suggestions, and she was willing to try several different looks to find one that was just right for me. I was so happy with the finished product, and my mom and sister also looked amazing! I highly recommend Meghana and hope to work with her again!" "Meghana did my wedding make-up. She arrived on time, was super prepared, and did my make-up exactly as I explained I wanted it done -- no rehearsal. She was super friendly and stuck around to touch up right before I left. Couldn't have had a better experience; it lasted all day, and I got TONS of compliments. Would use Meghana again in a heartbeat." "I had a pleasure working with Meghana a couple of weeks ago, She did my make up for my son's wedding as well as my sisters' and nieces' make up. She did an amazing job on all of us, we all loved it!!! Meghana arrived as promised, kept the schedule and we all had a great time working with her! I highly recommend using her services!" "Meghana was awesome! I am so happy that I decided to use her for my wedding. She was absolutely FANTASTIC with handling our small time frame, and with all the back and forth on where we would be getting ready! Meghana was easy to contact and was quick to respond. Everyone at the wedding complimented mine and the bridesmaids makeup. The salon we were at had nothing but great things to say about her, and everyone loved her! So happy that she helped me to feel my absolute best on one of the biggest days of my life!" "I stumbled upon Meghna's website when searching for someone to do my makeup for my engagement party. From my very first point contact with her, she exhibited the utmost professionalism which made working with her super easy and manageable. Her pricing was simple and straightforward. On the day of, she was punctual and fully-prepared with a great selection of makeup. 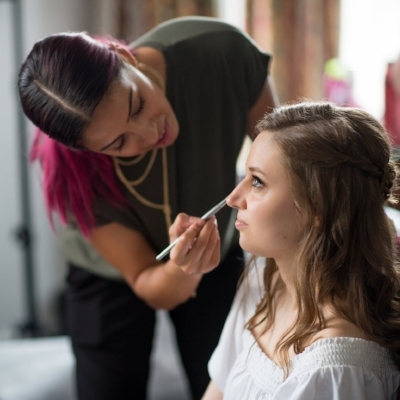 During the entire hair and makeup application process, I felt super comfortable letting her know exactly what I wanted and she gave great recommendations for what would look good with my complexion. I truly felt like I was in good hands and I could tell she really wanted me to love the final product! In the end, I was extremely pleased and got so many compliments on my hair and make up that night! Overall, Meghna is a delightful person to work with and I would highly recommend her work for any occasion!" "Just want to thank you again. I received so many compliments last night on my make up and even more on Facebook. Thank you for transforming me for a night. " "Meghana did my makeup for my maternity photo shoot. She did a fantastic job! I looked beautiful and my pictures came out wonderful! I would definitely use Meghana again for my makeup." "Meghana did an incredible job my makeup was flawless into the end of the night love the job she did on me and my mother. Highly recommended"
"Meghana was the perfect choice for my wedding day make-up! She made me and my bridesmaids look glamorous and natural, and squeezed us in despite having another wedding party to do that day. I reached out to her ~4 weeks before my wedding and she couldn't have been more timely or professional in her responses, and she was always accommodating. I would absolutely recommend her for weddings!"